Product News: New features to guide learners on their journey. This month we released a brand new activity in Blendedˣ: Action Plan. The objective of this activity is to allow learners to focus on the implementation of what they have learned. It also provides the administrator an overview of learners’ commitment in the learning program. Several Blendedˣ Action Plan activities can be added in a learning path. Learners can write up to 3 actions (per action plan) that they plan to complete, and a deadline for each of these actions. The activity is completed once all actions entered are marked as ‘done’. A reminder workflow is available to be able to follow-up on the actions and mark their completion. Learners can also print and modify their action plan. Please note that this delivery is a 1st milestone and that next month we will add a couple of additional features: facilitator view, completion e-mail, ‘.xls’ report for administrators and facilitators. The new My Activity page is mobile first and offers interesting new things to extend usage. 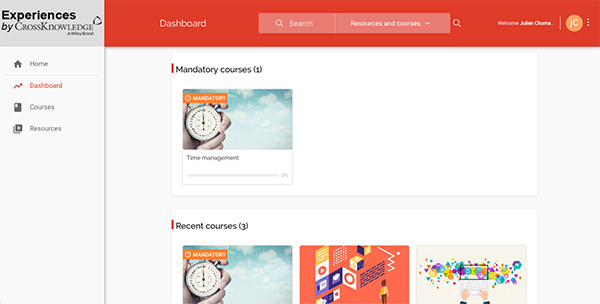 Learners can see mandatory courses (marked with visual aid). They also have direct access to their started courses and can continue from where they left off. Favorite resources are easily accessible. To guide learners, learning formats can be easily differentiate visually. The new My activity page and all the new possibilities (sorting, filters, …) are available on My Learning app but are not rolled out by default. Please contact the support team if you want to benefit from it! New roles for trainers, focus on group dynamics, training linked to professional life.